We use currently use Visual Studio 2017 for current development. The vast majority of the code is in C#, with a small portion in C++. You can use the community or free version that MS provides, or any of the higher paid versions. The current community version is quite good and is equivalent to the old Professional version. There are a couple settings that need to be configured in Visual Studio so your code formatting will adhere to our preferred style. 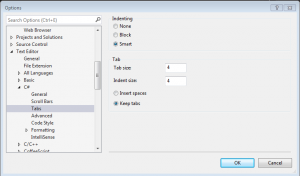 We use tabs instead of spaces to format our files. 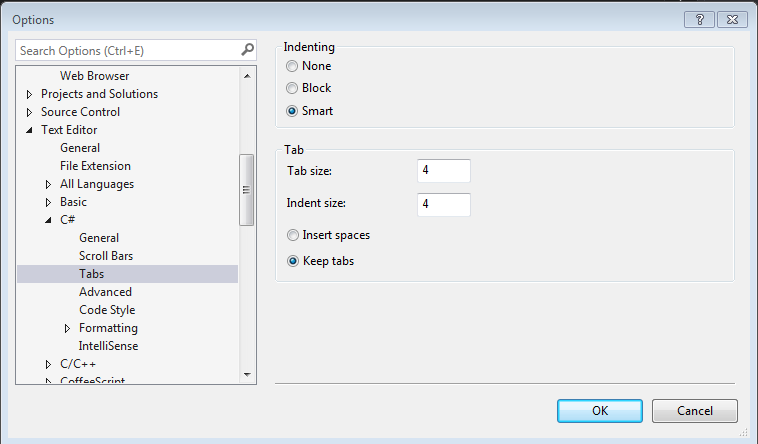 The following screen shot shows how you should configure the editor to do this automatically. You should verify any changes you make are using the correct formatting. You can do this with any diff tool that shows white space in the files. In the following diff, you can see that the new lines inserted have spaces instead of tabs for the indent formatting. This indicates that your settings are not correct and this should be fixed before continuing. If you are correcting any existing formatting issues, those should be done in separate commits specifically addressing format changes. We also have access to some very powerful tools courtesy of some of our partners who support open source projects. One very powerful tool is Resharper. If you are an active developer and are interested in using this tool contact us on the developer list and we can discuss getting you one of our team licenses. You have to be an active developer with a verifiable commit history.